Composting is a great way to reduce our waste and actually re-use our discarded waste to benefit our garden AND the planet. Your kids can get a primer on how to compost with the new book Compost Stew, written by Mary McKenna Siddals and illustrated by Ashley Wolff. The engaging poem and fascinating collage-style illustrations are sure to get your kid so interested in composting that you might have to prevent them from pulling the GOOD veggies out of the fridge! From eggshells to wiggly worms, this delightful recipe in bouncy verse features items—some familiar and some not so—that are fit for the home compost bin and will nourish Mother Earth. Vibrant collage illustrations use recycled and found materials to further a timely message. And to keep young environmental chefs fully informed about compostingdo’s and don’ts, there’s a note in the back about what’s not fit for the bin. 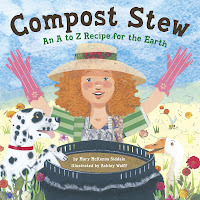 Giveaway: One lucky Jinxy Knows Best reader will win their own copy of Compost Stew. To enter, you must be a follower of Jinxy Knows Best. Check out the book HERE and then come back and fill out the entry form below. Rules: All entries must be received by 11:59 PM CST 6/12/10. One entry per person, except for extra entries (see below). Entrants must be at least 18 years old and reside within the United States. Winner must respond to the winning e-mail within 48 hours or a new winner will be selected. Disclosure: I received a copy of this book to review. I was not compensated in any way for this review.